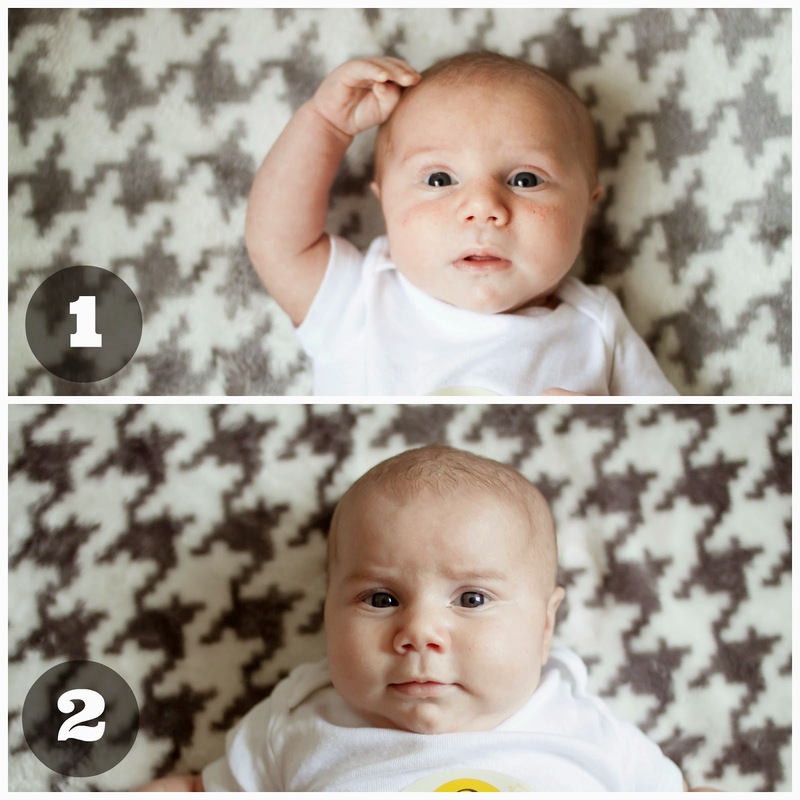 I Love You More Than Carrots: Collins Mason :: Month Two! 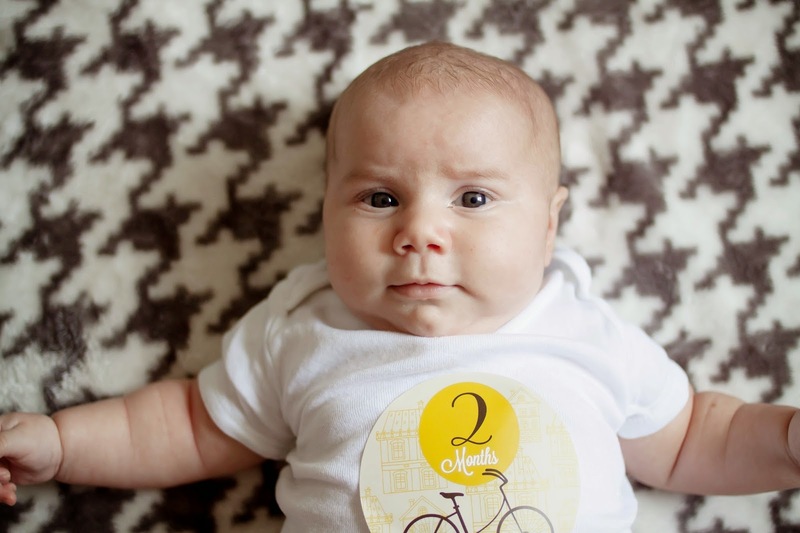 Collins Mason :: Month Two! 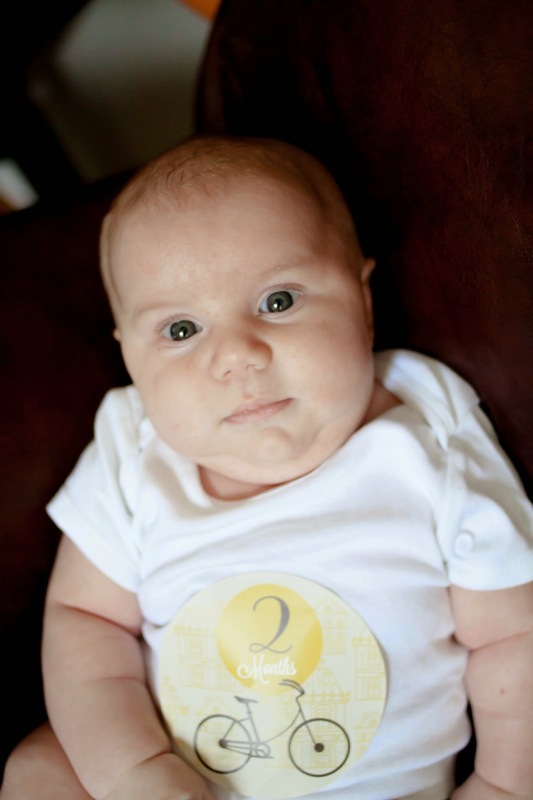 Collins Mason, you are two months old! I'd like to sit here and say to myself how I have no idea where these last two months have gone but the truth is, I know exactly what we've been up to and why the weeks are flying by! Part of me feels like that's the trouble with summer babies- you're so busy out and about enjoying the warm weather and sunshine, having fun unlike the winter months full of static boredom and horrible weather. It's been a busy month for you, that's for certain! At two months you weigh 15lbs. 10ounces and are a little over 23inches in length. Your hair is turning strawberry blonde and your eyes are changing from dark navy to green! 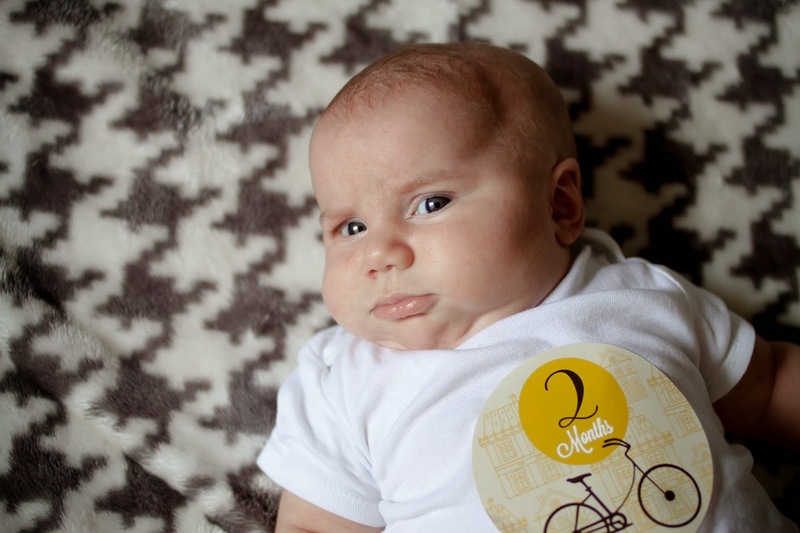 You comfortably wear size 2 diapers and have outgrown all of your 0-3 month clothes. You are wearing 3-6 month and 6 month clothes respectively. Nursing exclusively on demand and we've developed a pretty decent "schedule." You nurse about every three to four hours during the day and snack once or twice in between. You continue to be a very efficient nurser and wake only once or twice overnight to eat before you fall right back to sleep. It's evident you don't miss a single meal and we love every single one of the resulting rolls and dimples. Sleeping is much the same as it was last month. You're definitely awake for much longer periods of the day but will take one or two decent long naps for 2+ hours. You've started catnapping in between for 20-30 minutes and go down for the night around 8:30pm. You wake only once or twice overnight to nurse and quickly fall back to sleep. You are an excellent self-soother, something neither of your brothers were. You're sleeping in the Rock N' Play next to our bed and in our bed after your second wake-up around 4am. Around 7am I lay you back in the Rock N' Play so that I'm not clinging to the edge of the bed for the last hour of sleep. 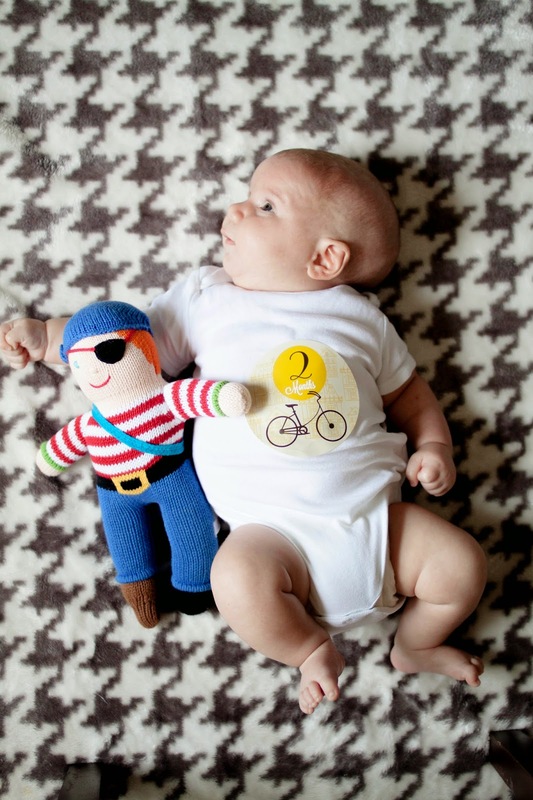 You were sleeping in the bassinet portion of the Breeze but kept waking yourself up as you would try to roll over. Loving strolling around the neighborhood in the 4Moms Origami, cooing and smiling like it's going out of style, taking naps, "talking" to your brothers, taking baths and when your Daddy holds you like a football. Going lot's of places! As the third and tiniest member of our family, you don't have the luxury of a schedule or a routine and you're much more of a "do as you go" kind of baby. You're an excellent rider in the car- on daily errands and running your brother to and from school, all the way to your very first trip to the beach! You've been to the beach twice now, Dutch Wonderland and we're gearing up to take you on your very first trip to New Jersey in the coming weeks! 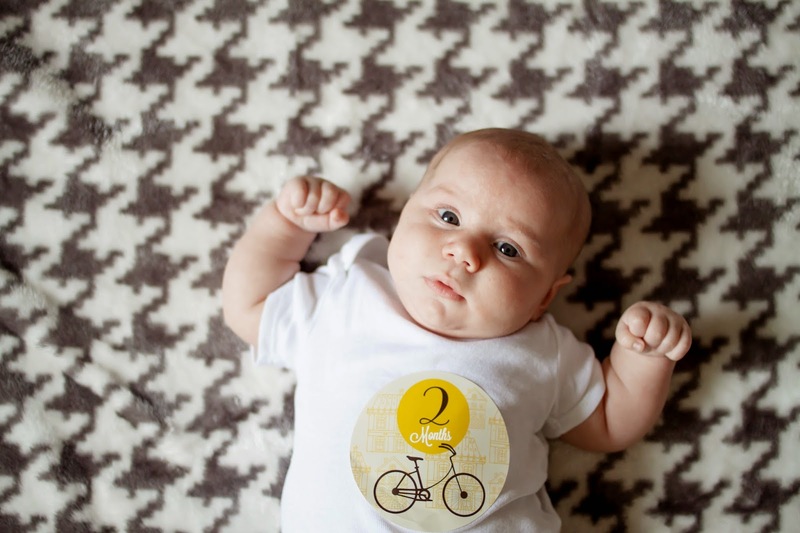 Doing exactly what you should be doing at two months old. Tracking, smiling, independent movements, holding your head up and sucking your fingers! You've been an "outside baby" for just two months now but it truly feels like you've been a part of our crazy family forever. I almost can't remember our days before you were a part of them. In just two short months Collins you've brought more love and laughter into our family than we ever could have imagined! We love you more than carrots little man! He has changed so much!! What a sweet little guy. Oh those cheeks! There's nothing cuter than baby rolls and chubby cheeks! Look at the rolls from one to two months!! Way to go mama! Sounds like he is doing a great job taking on the role of third brother and fitting right in! i am just in awe that it has already been two months. though i feel like he's been around forever! he's going to pass C up in clothes soon, what a growing boy! love that nursing is going so well for you. Ohmystars. He (and the rest of your sweeties) are the cutest. 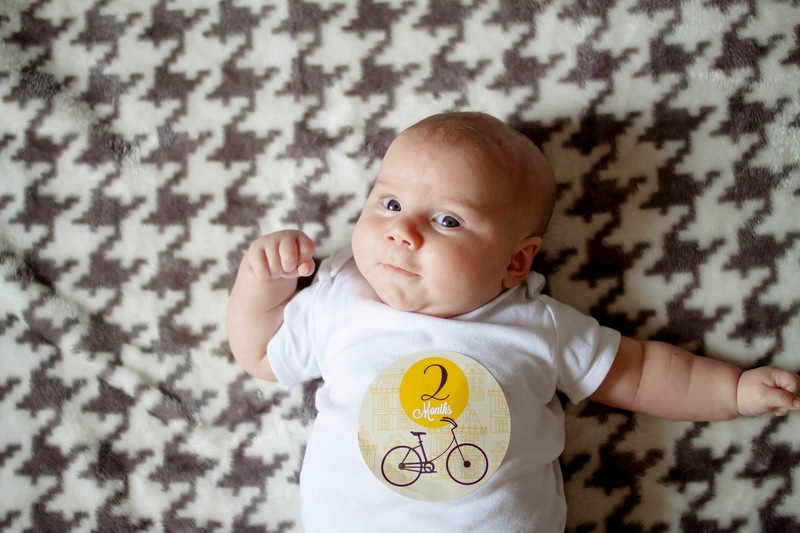 Happy 2 months, little guy! He's growing great! He officially passed up my 10.5 month old in weight! Dear Carter, This Is Four.